Spring is in the air and summer is near. The air is filled with love, laughter and weddings. Nothing compliments an outdoor wedding better than wedding arbors. Wedding arbors add elegance and beauty to any wedding or beach setting. Wedding arbors also create the picture perfect setting for capturing all of your memorable moments on your special day. Wedding arbors are normally seen in plain white and are easy to decorate. Decorating arbors are fun and easy by adding your own style and creativity. Within a matter of minutes you can have a wedding arbor decorated and looking like a true fairytale. With wedding arbors you are able to decorate it by using plant vines, tulle, garland and even lights to match your wedding colors. Not only are wedding arbors a cinch to decorate they are also effortless to maintain. 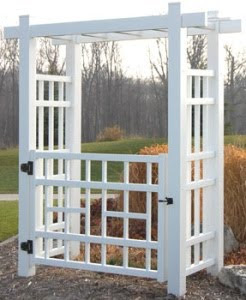 Buying a vinyl wedding arbor from Yard Envy guarantees a 20 year warranty, no fading in color and no discoloration. Buying an arbor is also beneficial. 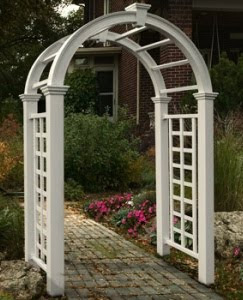 Once your magical day is over, you can use your arbor as a gateway to your garden and have a lasting memory every time you enter or look out the back door. 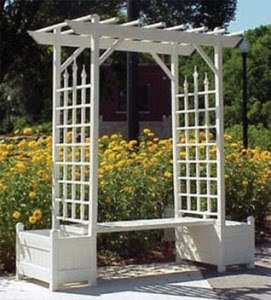 You can also turn your wedding arbor into a bench overlooking the lake or your favorite rose garden. 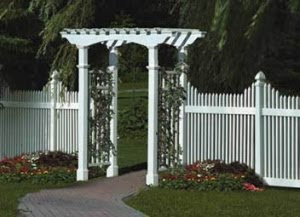 You may even accent an arbor with a vinyl gate, cottage picket wings or add an arbor to your vinyl picket fencing. Yard Envy offers many arbor accessories at an affordable price and something for everyone's personal preferences. Vinyl arbors are fun to decorate and easy to maintain, giving you more time to spend with loved ones and in the garden. Spruce up any event and enjoy your backyard at it's finest with a stunning vinyl wedding arbor.